Powers/Abilities: Croglin had an acute sense of smell, allowing him to smell when elves had been in the area. History: (Hulk Comic#13/2) Croglin was in charge of a battalion of Goblins travelling on Earth near the fringes of Otherworld, hunting for some human heroes (Vortigen, Black Knight and Captain Britain) and their elven allies. When one of the goblins claimed they had taken the wrong path, Croglin informed his troop that this was the right way, because he could smell elves, which he stated he hated...unless of course they were properly cooked. 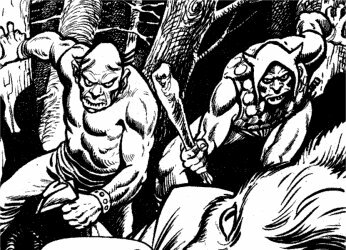 Another goblin stated he could hear something coming up the path behind them, and Croglin ordered the troop to hide. They watched as Lupe, Vortigen's wolf, passed by. Recognising the animal and realising it was returning to his master, they decided to simply follow it until they caught up with their quarry. (Hulk Comic#14/2) Lupe led the troop to an elven village. One of the Goblin archers asked Croglin which target he wanted picked off first, but Croglin angrily told him to shut up lest he spoil their surprise attack. Croglin then told him to take the first person he had a clear shot of. The goblins launched their assault, with Groglin shouting that by the time the night ended he didn't want to see a single elf left standing. (Hulk Comic#15/2) Elven archers downed many of the goblins in the first wave, but Croglin berated his forces to press the attack before the enemy could reload. The charge resumed and battle was joined, but the three human allies of the elves proved formidable opponents, eventually forcing a retreat. 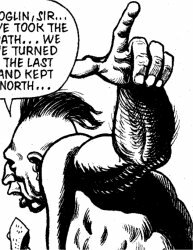 (Hulk Comic#16/2) As Croglin rested back at the goblin camp, two of his troop brought in a captive, Moondog, one of the elven leaders. Croglin crowed that the elf was "hardly more than a mouthful", but was caught by surprise when the diminutive prisoner launched himself at him. Two goblins hauled Moondog off their leader, but not before he managed to cut Croglin's face, drawing blood. Secretly afraid, the goblin leader called for his axe, and while Moondog was held down, Croglin made to decapitate him. The axe was about to fall, when Cormac the Sword Master, one of the "evil Walkers", caught the haft, preventing the fatal blow. Cormac twisted Croglin's arm, forcing the goblin to prostrate himself, while the evil Walker berated him as a fool, pointing out the elf was more useful alive as bait for Vortigen. When Croglin complained about the pain in his hand, which Cormac was crushing, the Walker sent him flying with a vicious blow, and promised to one day crack the goblin's skull "just to see what kind of addled brain lurks within." (Hulk Comic#17/2) Having usurped Croglin's command, Cormac tried to question Moondog, but when the elf proved uncooperative, Croglin demanded to take over the interrogation, stating he would hack off the captive's ears and roast him over an open fire: "I guarantee he'd tell yer everything!" But the goblin cowered back when Cormac stood up and announced that Croglin disgusted him. In his first appearance he was clearly called Groglin, but from the next issue on he'd become Croglin. Perhaps his name was Groglin Croglin? For the profile I've stuck with his latter spelling throughout, since it was by far the most commonly used. To add to the inconsistency, he was usually drawn as having a pony-tail, but occasionally was clearly bald. His goblins also couldn't decide whether he was their "Captain" or their "Chief". Mind you, if you check out Bogweed's sub-profile, you'll see that it appears that some of them couldn't even remember whether a name belonged to them or the guy standing next to them, so I guess the goblins just weren't too bright. Hulk Comic#17 was the last named appearance by Croglin, where he was last seen being insulted by Cormac. However it's entirely possible he was among the hordes of Necrom's army during the assault on Camelot. 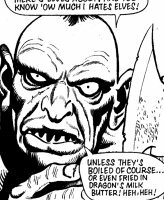 The goblins listed in the sub-profiles could also have appeared in all the other issues Croglin was in, but if so, they weren't named. A member of Croglin's battalion, he was convinced that they had taken a wrong turn and lost the trail of their prey. Two members of Croglin's battalions, they managed to capture Moondog during the battle at the elven village. Bogweed popped a sack over the elves head, then his cohort struck the struggling Moondog with a club. 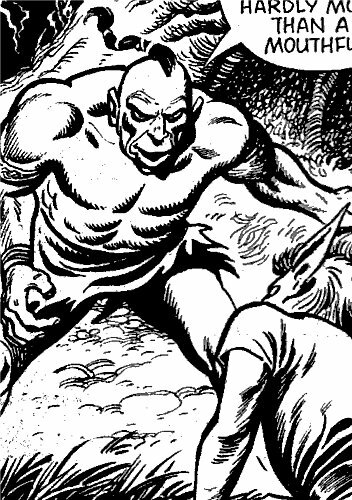 They carried their captive back to the Goblin camp and deposited him at Croglin's feet. Artistic consistency (or perhaps the placement of word balloons) not being a high priority, in Hulk Comic#15 Bogweed is clearly the non-helmeted and vested one of the duo, but by the next issue, it is the other way around. Either a mistake was made, or after capturing Moondog the pair stopped long enough to swap clothes for reasons I don't even want to think about.